Click here for a higher resolution image of the instrument. Click here for an image of the networked virtual instrument. Complete with any two modular probes, multi-mode serial network card, serial cables for Macintosh and PCs, virtual instrument and utility software, owner's manual, NIST / MIL-STD-45662A performance certificate with test data, and two year warranty. Ready To Use. Automation and Higher Performance at a Value Price. * Please note that as of 1 January 2008 this instrument is no longer listed to UL 3111 by ETL. The design, construction, testing, and calibration of the instrument has not changed, but rather Hypatia no longer maintains the certification service of ETL due to the high costs of the service relative to the sales volume of this instrument. Please contact Hypatia Inc.if you have questions or concerns about this aspect of the instrument. Certain UL, CSA, VDE, TUV, BABT and other safety certification specifications require that your product's earth grounding system pass an impedance test while simultaneously carrying a substantial fault simulation current. The Model 309 fully satisfies these requirements, including AC test current requirements, in a fast and efficient manner as required in production line environments. This instrument features a 16 bit Motorola 68HC16 microcontroller, updatable flash memory based Operating Software, a network card slot, and ActiveX software support to provide versatile automation technology support. Very dense over-sampling of remotely sensed waveforms at high A/D resolution (16 bit) and precision fixed components provide clearly superior accuracy, yielding the highest level of confidence in your safety verification measurements. 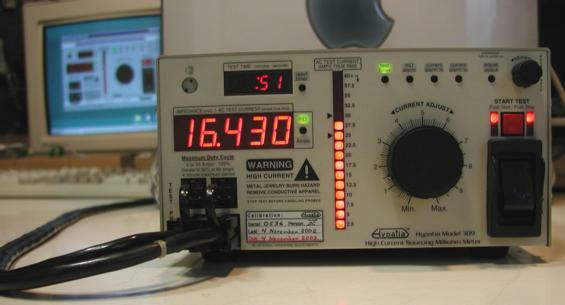 A five digit led display indicates impedance in milliohms from 0 to 100 ohms, and a precise dot or bar graph meter indicates true RMS test current (which may also be displayed digitally if desired). An additional display indicates test time in minutes and seconds. The test current is continuously variable from near 0 to over 60 amps. Generally no adjustment of the test current is necessary when testing similar products, but it should be monitored by reference to the bar graph or audio alerts. Basic accuracy is ±1%. Typical accuracy of current production instruments is better than .1% (1/10%) for all readings - tighter new specs will be published soon. Tests are timed in one second increments up to a maximum of one hour. Test termination and reset for next test occur automatically. Settable audio alerts for high impedance, low test current and high test current are provided. Test time, audio alert thresholds and other parameters are set by a rotary actuator and easy to follow menu interface with front panel display cues, and stored in flash memory. A 100 milliohm resistor mounted on the rear panel allows informal daily verification of impedance accuracy. The network card slot is equipped with a standard multi-mode serial card which provides AppleTalk, LocalTalk, EIA-422/485 and EIA-232-E (aka RS-232). (LocalTalk software support is not yet available, but planned.) IEEE-488 (GPIB), USB and other cards are planned. Current software includes refined ActiveX programming support, a modified SCPI command set, a Windows® and Windows NT® utility which provides virtual instrument operation, calibration support, an Operating Software update installation utility, a duty cycle test utility, and additional functions. Software updates and support information are provided on the Web. Since the network interface is card slot based and the Operating Software is flash memory based, this instrument will evolve with you as networking and software technologies move forward. Remote sensing is built into all probes, thus eliminating cable resistance errors. The probes are of modular design, easily interchanged, and offer a higher level of interconnection efficiency and versatility than connection systems from any other vendor, and unsurpassed measurement accuracy. State of the art design utilizes only precision fixed components. There are no internal hardware adjustments, and therefore no internal access is necessary. Software calibration or performance verification are straightforward closed case procedures, yielding very high economy, safety and consistency of certification maintenance. Hypatia recertification is only $50 fob (1998). Macintosh, AppleTalk and LocalTalk are trademarks of Apple Computer Inc. Windows and Windows NT are registered trademarks of Microsoft Corporation. Note: The typical accuracy of the latest instrument version is better than .1% (1/10%). Tighter new specifications will be published later. test contact impedance adds approximately 1 to 2 milliohms to measurements. This error is eliminated if the Model 109 Kelvin probes are utilized.